The Vedic deities symbolize the forces of nature as well as inside human beings. While discussing the symbolic significance of Vedic deities in his The Secret of the Vedas, Rishi Aurobindo says that the gods, goddesses, and demons mentioned in the Vedas represent various cosmic powers, on one hand, and man's virtues and vices on the other. 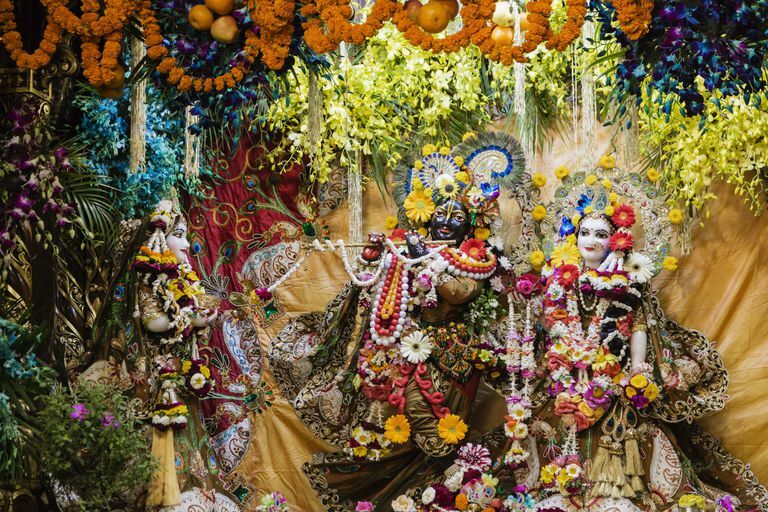 Idol worship and rituals are at the heart of Hinduism and have great religious and philosophical significance. All Hindu deities are themselves symbols of the abstract Absolute and point to a particular aspect of the Brahman. The Hindu Trinity is represented by three Godheads: Brahma - the creator, Vishnu - the protector, and Shiva - the destroyer. Unlike the followers of any other religion, Hindus enjoy the freedom of worshipping their personally chosen icon to offer their prayers to the indefinable Brahman. Each deity in Hinduism controls a particular energy. These energies, present in man as wild forces must be controlled and canalized fruitfully to infuse a divine consciousness in him. For this, man has to gain the goodwill of different gods who stir up his consciousness accordingly to help him master the different forces of nature. In a person's path of spiritual progress, he or she needs to develop the various attributes of these godheads in him or her to attain all-round spiritual perfection. Each Hindu God and Goddess has many characteristics, like the dress, 'vehicle', weapons, etc., that are themselves symbols of the deity's power. Brahma holds the Vedas in his hands, which signifies that he has the supreme command over creative and religious knowledge. Vishnu holds a conch which stands for the five elements and eternity; a discus, which is the symbol of the mind; a bow that symbolizes power and a lotus which is the symbol of the cosmos. 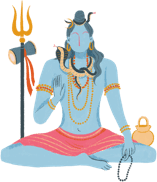 Shiva's trident represents the three gunas. Similarly, Krishna's flute symbolizes divine music. Many deities can be recognized by the symbols associated with them. Shiva is often symbolized by the 'linga' or 'tripundra' - the three horizontal lines on his forehead. In the same way, Krishna can be identified by the peacock feather he wears in his head and also by the prong-like mark on his forehead. Each deity has a particular vehicle on which he or she travels. These vehicles, which are either animals or birds, represent the various forces that he or she rides. Goddess Saraswati's vehicle, the graceful and beautiful peacock denotes that she is the controller of the pursuit of performing arts. Vishnu sits on the primal serpent, which represents the desire of consciousness in humankind. Shiva rides the Nandi bull, which stands for the brute and blind power, as well as the unbridled sexual energy in man - the qualities only he can help us control. His consort Parvati, Durga or Kali rides on a lion, which symbolizes mercilessness, anger, and pride - vices she can help her devotees check. Ganesha's carrier, the mouse represents the timidity and nervousness that overwhelm us at the onset of any new venture - feelings that can be overcome by the blessings of Ganesha.